BULAWAYO, Zimbabwe, Jul 31 2018 (IPS) - Counting is underway today across Zimbabwe as the country voted in an historic election on Jul. 30, which many expect will bring political and economic transformation. It is a long-awaited change for many after autocratic leader, Robert Mugabe, was ousted in a soft coup in November 2017 after 37 years in power. A post-Mugabe future has provided a kindling of hope among citizens that a new Zimbabwe, which can offer a better life for all is still possible. The country has survived a myriad of crises that have traumatised its citizens, scared investors and left this resource-rich country isolated internationally. It was an election pregnant with expectations for change and transformation. Economic restoration, jobs, unity, peace and prosperity have been key election expectations. “A non-violent election is a big step but of course at the end of the day the real crisis is still here, the economic crisis." -- David Moore, researcher and political economist. On election morning in the Bulawayo suburb of Famona, the lines where short and it took most people less then 10 minutes to cast their votes. But people were trickling in. And soon most of the 10,000 polling stations across the country had long queues. No reports of violence have been reported so far. Though the Zimbabwe Republic Police told a local radio station yesterday that a few voters had been nabbed for sloganeering outside voting stations in direct violation of election rules. Political analysts told IPS that while Zimbabwe has all the potential to turn around its fortunes, it is a tall ask that this election needs to deliver on. 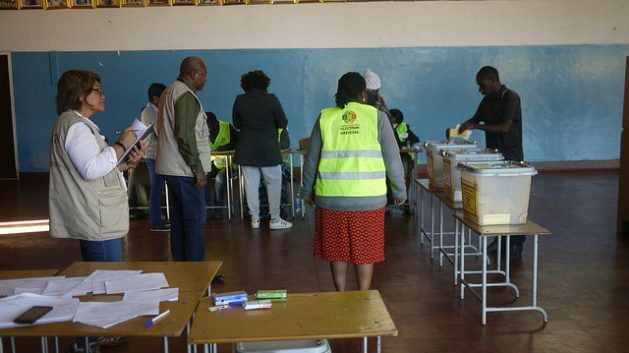 The voter turnout yesterday was high as more than 75 percent of the five million Zimbabweans registered to vote went to the polls to choose a president, members of parliament and local government councillors. There were 23 presidential candidates and more than 100 political parties with registered candidates to contest the 210 seats in the House Assembly. The presidential contest – the most important of all – appears a largely two horse race pitting current Zimbabwean president, Emmerson Mngangwa (75) of the ruling Zimbabwe Africa National Union-Patriotic Front (Zanu PF) against president of the Movement for Democratic Alliance (MDC), Nelson Chamisa (40). Mnangagwa is a lawyer and was Mugabe’s point man for many years, having served in government since independence where he held the portfolios of minister of state security and minister of justice. He was the vice president until he was fired by Mugabe in 2017. Chamisa, also a lawyer and firebrand activist, is a founding member of the MDC under the late Morgan Tsvangirai. He succeeded Tsvangirai in March 2018 in a controversial manner that split the party and which saw Thokozani Khupe lead a breakaway faction. Khupe is one of four female candidates vying for the presidency. Calling the presidential race a “male” race, pitting men from the privileged classes against each other, Professor Rudo Gaidzanwa, a lecturer at the University of Zimbabwe and social commentator, told IPS this contest excluded even elite men who are perceived to be competent but “alien” because they do not exhibit the earthy, violent and killer characteristics that can win a party the election and appeal to the grassroots. “Men of violence and force are admired and accepted because they are perceived as being able to fight for their constituents and followers. This is a legacy of Zimbabwe’s struggle for independence that extolled the virtues and legitimacy of violence as a means of achieving political ends. That legacy continues to haunt us,” said Gaidzanwa. “They have shown us what they are capable of doing to their own people! If you look at Zimbabwe’s political and nationalist elites that pillaged diamonds, agricultural and land you will realise that in Africa, we are yet to embark on a class war that attempts to restore to the working people the wealth of their countries. Zimbabwe has a harsh history of violence, dating back to before this southern Africa nation became independent in 1980. The price of that violent past has been dear—deep divisions and polarisation along ethnic, and political lines, economic ruin and palpable corruption. These are some of the legacies blamed on Mugabe who led Zimbabwe for 37 years before a coup forced him into permanent retirement. In 2008 Zimbabwe’s economy had been on the brink of collapse, experiencing hyperinflation of unprecedented levels. The country was forced to abandon its currency, the Zimbabwean dollar, and replaced it with the United States dollar, to stabilise the economy. Moore said the 2018 elections were different for many reasons. There was no Mugabe—at least on the ballot paper—and neither was there his erstwhile political foe, Tsvangirai. Former president Mugabe, in an election eve press conference at his home in the capital Harare, on Jul. 29, said he would not be voting for the Zanu PF because it still harboured his tormentors and the reason he was out of power. Chamisa is seeking legitimacy. He is a young contender for the highest political office in the country and has made his own blunders along the way. But he is seeking to prove he can lead and change the future for Zimbabwe. For Mnangagwa, who has been at the helm for seven months, the key is to legitimise his rule and to cement international relations. ‘Zimbabwe is open for business’, has been his campaign mantra. “Usually processes like an election after a coup are not that successful because a coup has its characteristics of using force and not wanting to give up but when you look at the effort of the coup makers to legitimise this coup by having free and fair elections you have a certain amount of pressure from the donors and the investors,” Moore told IPS. A compromise of sorts like a semi-government of national unity could be in the office, Moore believes. The jury is out still about the choice Zimbabweans made at the ballot this week, and whether that choice will take the country out of its conundrum and raise it to a new level.